This is the second blog post in a four part series. In the first post, we reviewed the structure of a simple C program. In this installment, we will cover disassembling this program, and reviewing the Assembly code generated by the compiler, GCC. Next, let’s compile it using GCC. I’m going to include the “–fno-stack-protector” switch, to avoid adding a stack canary. This will simplify things, and allow us to walk through a simple stack based buffer overflow in the 3rd blog post of our series. To disassemble our program, we’ll use objdump. So, let’s look at what’s going on here. These first two lines are the function prologue. The first pushes EBP, the base pointer, onto the stack. The second line copies ESP, the existing stack pointer from the previous stack frame, into EBP. The next line aligns the stack to a 16-byte boundary. This is another instruction added by the compiler. The fourth line “sub esp,0x10” allocates 16 bytes of space on the stack. Remember that the stack grows towards lower memory addresses, so allocations will use ‘sub’. This is carving out space for ‘buf’. 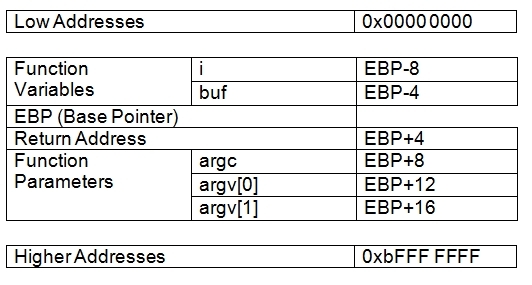 The fifth line moves the memory address 0x80485ce into the location pointed to by ESP. It denotes this as being a DWORD or double word, which is 4 bytes (32 bits). In this case, it is the string "Passing user input to func()\n” that is being moved here, as it is setting up for the puts() function. Note: Whenever you see brackets around something in assembly, such as we see with ESP here, it’s pointing to the value (the actual data) in the memory address, that is being pointed to (in this case by ESP). This is called dereferencing a pointer. We’re going to see the behavior of something being shoved into a memory address pointed to by ESP right before a function is called a few more times before we’re done. This is the equivalent of pushing a value onto the stack so we can work with it. The sixth line makes a call to puts(). You may be wondering why this is since it was not in our source code. The answer is that it is a compiler (GCC) optimization. If we were to specify –fno-builtin-printf when we compiled the program, we would see printf() being called here instead. Anyway, back to puts(). Three things happen here, first ‘call’ puts the address of the next instruction (80484d1) on the stack so the program can return to it after puts() is done executing. Then it calls puts() which prints the string "Passing user input to func()\n" to stdout. Line seven moves the value at ebp+0xc (12 bytes down the stack from EBP) into EAX, then line eight moves us another 4 bytes. The best way to figure out what that is would be to look at how the stack frame is laid out. As you can see, EBP+12 contains the function parameters that we are passing in from the command line. However, recall from our first blog post that the first element in the argv array, argv, is always the program itself, so we would want the second element in the array, argv, which is EBP+16. Note: It’s helpful to remember that each memory address is 4 bytes (32bits), or one DWORD (double word). So, each line of assembly that we are covering here equates to 4 bytes. The next three lines are best looked at together. Line nine dereferences the pointer that EAX points to (grabs the value at the memory address that EAX points to) and stores that value in the EAX register itself. This is our command line argument. Then, line ten moves that value from EAX into a location pointed to by ESP. Lines nine and ten are setting up the function variables for func(), and then on line eleven we call func(). This which will once again place the address of the next instruction (80484e1) on the stack, execute func(), and then return to address of the next instruction, 80484e1, when func() is done. Here we collapse our stack frame by moving EBP into ESP, and then pop EBP off the stack. Finally, ‘ret’ pops the return address of the previous stack frame off the stack and returns to it. Once again, the first two lines are the function prologue. Next 0x28 bytes of space is allocated on the stack. Then, the value at EBP+0x08 is loaded into the EAX register. To figure out what that is, let’s refer back to our stack diagram. At EBP+8 (8 bytes ‘down’ the stack from EBP) is the ‘ptr’ pointer variable. So, it is loading the value of *ptr, (brackets mean ‘actual data at location in memory’, remember? ), into the EAX register. Note: The value in *ptr is the contents of argv. When main() called func() it passed argv as a parameter. Yup, there it is. So, here we are calling strlen() with ‘ptr’ as an argument. As mention in our first blog post, strlen() returns the length of a string. It iterates through until it hits a null byte. So, look at the source code below. We’ve just done the part in red. Now, I’m guessing the value we get out of strlen() is headed for printf() to fill in the %d, don’t you? EAX is generally used to contain the output of a function, so the output of strlen() (the length of the data in *ptr) is now in EAX. It’s likely moving it into EDX for the moment, so EAX can be used for something else. Now that we’ve freed up EAX, we can move the memory address 0x80485b0 into it. Now, we’re moving the value in EDX (the output of strlen()) into ESP+4. That’s 4 bytes, or one memory address ‘down’ the stack from ESP. Then we move the contents of EAX (the memory address 0x80485b0) into a location pointed to by ESP. Yup! Here we call printf() and print "copy %d bytes of data to buf\n" to stdout. The %d being the length (as determined by strlen()) of the argument we provided to the program at runtime. Line 12 moves the value at EBP+8, which is *ptr, into EAX. Line 13 then moves it from EAX into the location pointed to by ESP+4. Line 14 gives us a new instruction, LEA. LEA stands for ‘load effective address’, and it does just that. In this case, it loads the memory address (not the contents) at EBP-12 (0x12 bytes ‘up’ the stack from EBP) into EAX. Here we call strcpy() and copy the contents of ‘ptr’ into ‘buf’. Just as a quick note: line 4 “sub esp,0x10” should reserving 16 bytes, not 10.
should be 16 bytes, no? Compiler is doing alignment tricks. Thanks for a great tut! From the command "objdump -M intel -d basic | grep -A 15 main. : "